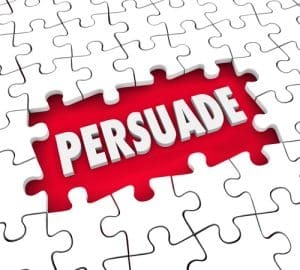 Devotion to clients and persuasiveness win for criminal case clients. Slickness and polish may look good, but devotion, preparation, realness and persuasiveness win in court. As a Virginia criminal lawyer, I know that it is important to be well-groomed in court and to maintain good physical, mental and spiritual health, but — as nice as they might look — Hermes neckties, Hugo Boss suits and Rolex watches are not what win trials. Winning trials comes after shoveling a lot of dung to turn it into fertilizer and to find the gold in that dung. The only way to tolerate the stink of that dung is for me to be devoted to my client, to love the work I do, and to delight in how much more closer I approach victory by staying on this path. When I still was a corporate lawyer two years out of law school, my otherwise excellent dentist asked me how I liked my appearance and speaking, and I said I liked them just fine. He then pointed out the gap between my two front teeth (a common gap size for many), and said that getting veneers on them would limit any hissing in my speaking (which I think is barely present or not present) and make me more presentable when speaking to the public as a lawyer. Veneers and dental caps are fine for those who want them. Never underestimate the power of being real, though. As the great, late John Johnson famously said, he much preferred having a bucket of cow dung to a bucket of beautiful fake flowers, for at least the cow dung bucket holds something real. Judges and jurors come from many backgrounds, and realness never goes out of style. Our real self knows instinctively how to deal with a humdinger from our client on the witness stand or a taunt from a judge. Our instead obsessing over the fanciness of our shoes distracts us from knowing how to battle, and nobody in a foxhole wears fancy shoes. While that is not to say to go to the extreme of great trial lawyer Anthony Serra, who wears secondhand clothes that he sometimes repairs with tape, it is to say to rely on ourselves, our intuition, and our realness in persuading. A potential hurdle I had in law school and my first law firm (a corporate law firm) was the often excessively dry and mind-numbing material and law involved on this path. Fortunately, I went to law school in part to learn the language of people intentionally or unintentionally using the law to oppress others. Moreover, criminal defense is full of stimulating ideas and law — constantly involving the Constitution and Bill of Rights –which simply needs to be used for good, and not oppression. Obtaining as much victory as possible is what criminal defense practice is all about. Northern Virginia criminal lawyer Jonathan L. Katz is driven on the winning path by his total devotion to his clients. To discuss your case with Jon, please call his staff at 703-383-1100 to schedule a confidential consultation.